Every week comes the hope that things will get better. You know, slow down, get back to a normal where we’re seen as all being on the same team, and America could seem like America again. But every week brings a new set of crises for the Trump administration, guided by a moral compass that spins wildly as if there’s no true north, no Constitution, no democracy, no country of the people, by the people, and for the people. There are just Trump political and financial interests. Leadership? Common sense? Nah. It leaves us with an administration that will make your head spin–spin being the operative word. Mueller Report? To release? To redact? Is Attorney General Barr a loyal American or a simple Trumpist? But on Thursday, Trump was claiming ignorance. No knowledge about Assange. All that would be good fodder for several news cycles. Then came another Trump 360 before the close of business today. Remember Trump’s recent call to close the southern border? First Trump said now, then he said to put it off for a year. But the truth? On Friday, the New York Times reported Trump urged his acting secretary of homeland security to close the border, despite publicly saying it would be delayed. Still, the best example of Trump spin this week, at least for us Asian Americans, came when the Washington Post broke the story that Trump wanted to send immigrant detainees to sanctuary cities, such as House Speaker Nancy Pelosi’s San Francisco. White House aides were quick to deny the story. That’s what political folk do when they’re exposed by the press. When caught, operatives lie for the boss. But then the White House media office was trumped by the lying boss. He told the truth for a change. “Due to the fact Democrats are unwilling to change our very dangerous immigration laws, we are indeed as reported giving strong considerations to placing illegal immigrants (sic) in sanctuary cities only,” said Trump said in a Friday morning tweet. Honest and refreshing? Or just caught? Is it a sign of candor to just own your bad idea? The notion of sending detained immigrants to sanctuary cities as political retaliation is the kind of crass and cynical move you’d expect from a reality show Rush Limbaugh wannabe. Hey, wait, that’s what we have. You figure by the end of the first term, and maybe his last term, the man elected to the position would be more than just aspiring to be the leader of the largest democracy of the free world. He should be acting like one. But in this administration, only the appointed heads of the bureaucracy are acting. The actual president is his same blustery self. It’s what you get with a White House occupant who just wanted the fame of running for president, but none of the actual responsibilities. 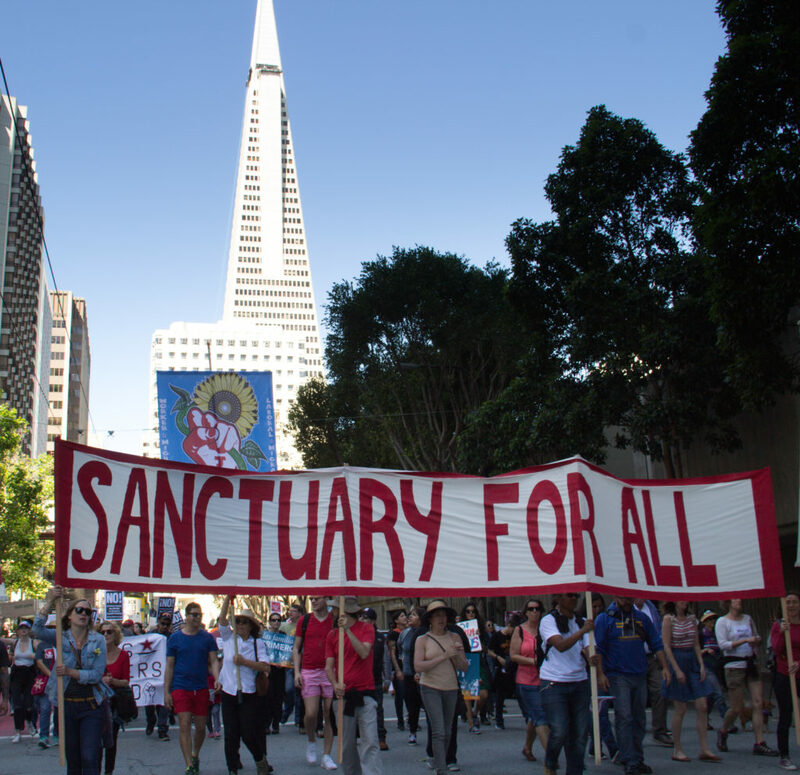 If there is a plus side to this sanctuary dump story, it’s that we can revisit the reasons why “sanctuary” shouldn’t be seen as a dirty word, and why California is a proud sanctuary state. Quite simply, sanctuary requires that ICE agents and local and regional law enforcement stay in their lanes, as California Assemblyman David Chiu, (D-San Francisco) explained on “Emil Amok’s Takeout” in 2018. Sanctuary recognizes that immigration officers are funded by the feds and have their own duties—to enforce immigration laws. Local and regional police have different jobs, funded by the state to protect the public. And when people think they’ll be turned over to ICE, you have whole communities that will shut off the police. Witnesses don’t come forward. Victims don’t come forward. The job of law enforcement is made nearly impossible. But the law doesn’t mean one can’t be arrested by ICE. Chiu explains the concept of sanctuary on the podcast. Go to the interview at around 6:00 for a general discussion about Trump’s immigration policies. But turn to 18:33 to hear Chiu’s explanation of what sanctuary laws actually mean. Or listen to the whole thing. Trump proposing the sanctuary dump, then lying about it, then owning it, just shows the sad state of our nation, leadership-wise. At least if you didn’t understand what the sanctuary law meant beforehand, now you do…and much better than the president of the United States.